EC student, Mayra Ferreira, graduated on March 8th. 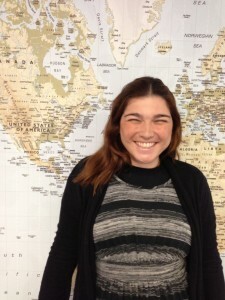 Before she left, she filled out an EC Testimonial describing her experience at our school and in San Francisco. Thanks, Mayra! We enjoyed having you here. Come visit us again soon! I came to San Francisco and studying at EC was an amazing and excited experience. I’ve been studying here for four weeks and it was one of my greatest adventure abroad. I recommend EC San Francisco because you can find great teachers that make learning English easier with their funny ways to teach and outside activities. All those things really helped me improve my English. Furthermore, EC San Francisco is located near good places to visit and have easy access to touristic spots, which is an excellent thing. I’ll miss all the friends I made at EC and certainly I’ll always remember all different habit and history about their countries and cultures that we shared in our classes.